After spending a mostly uneventful day birding around the city yesterday, I was surprised by an email this morning … local birder Lisa de Leon had photographed an intriguing bird on a field in the Goulds. 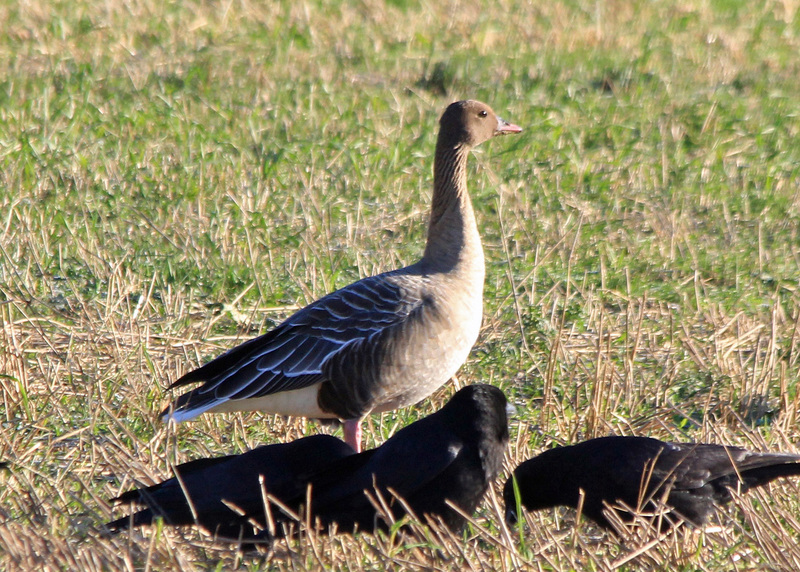 Moments later, she sent an excellent photo that confirmed her identification – PINK-FOOTED GOOSE!! I had birded that area myself yesterday without even a hint of a goose. Lisa de Leon photographed this Pink-footed Goose on the outskirts of St. John’s on the morning of November 19, 2012 – an exciting find! This will be the eighth record for Pink-footed Goose in Newfoundland, but the first for fall. All other records have been in spring – despite the fact that many of the North American records outside this province have been during fall migration. This particular goose was grazing in a field with crows and pigeons, but picked up and flew off towards some other fields immediately after discovery. A few birders are out there looking, so it “should” get relocated. Check back for updates!